Thermal Management of Electric Vehicle Battery Systems provides a thorough examination of various conventional and cutting edge electric vehicle (EV) battery thermal management systems (including phase change material) that are currently used in the industry as well as being proposed for future EV batteries. It covers how to select the right thermal management design, configuration and parameters for the users’ battery chemistry, applications and operating conditions, and provides guidance on the setup, instrumentation and operation of their thermal management systems (TMS) in the most efficient and effective manner. This book provides the reader with the necessary information to develop a capable battery TMS that can keep the cells operating within the ideal operating temperature ranges and uniformities, while minimizing the associated energy consumption, cost and environmental impact. The procedures used are explained step-by-step, and generic and widely used parameters are utilized as much as possible to enable the reader to incorporate the conducted analyses to the systems they are working on. Also included are comprehensive thermodynamic modelling and analyses of TMSs as well as databanks of component costs and environmental impacts, which can be useful for providing new ideas on improving vehicle designs. 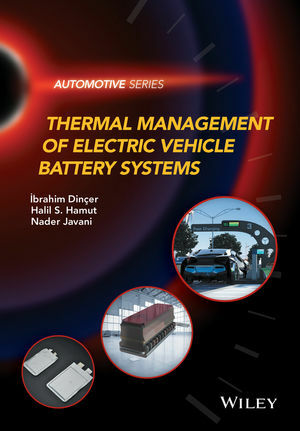 Thermal Management of Electric Vehicle Battery Systems is a unique book on electric vehicle thermal management systems for researchers and practitioners in industry, and is also a suitable textbook for senior-level undergraduate and graduate courses. Ibrahim Dincer is a full professor of Mechanical Engineering and director of Clean Energy Research Laboratory at UOIT. Renowned for his pioneering works in the area of sustainable energy technologies, including clean transportation options, he has authored/co-authored many books, book chapters, and refereed journal and conference papers. He has chaired national and international conferences, symposia, workshops and technical meetings and delivered many keynote and invited lectures. He is an active member of various international scientific organizations and societies, and serves as editor-in-chief, associate editor, regional editor, and editorial board member on various prestigious international journals. He is a recipient of several research, teaching and service awards, including the Premier's research excellence award in Ontario, Canada. He has recently been recognized by Thomson Reuters as one of The Most Influential Scientific Minds in Engineering. Halil S. Hamut is a Chief Senior Researcher at The Scientific and Research Council of Turkey (TÜBITAK) and the project manager for developing Turkey’s first brand of national electric vehicles. He received his PhD from the Faculty of Engineering and Applied Science, University of Ontario Institute of Technology in Canada, in 2013. He has previously collaborated with General Motors Company in Oshawa, Canada and worked for Ford Motor Company in Michigan, U.S.A He has published many journals and conference papers and has been a reviewer for several journals. His research interests are primarily concerned with exergy, exergoeconomic and exergoenvironmental analyses of electric and hybrid electric vehicle thermal management systems.